Coastal wetlands provide a suite of ecosystem services critical to people and the environment, including flood protection, erosion control, wildlife habitat, commercial fisheries, water quality, recreation and carbon sequestration (Figure 1). The total annual value of these services is in the range of billions of dollars, or up to $200,000 per hectare per year. The response of coastal wetlands to sea-level rise during the 21st century is thus a critical and emerging environmental, socioeconomic, and political issue, and has broad implications for coastal livability, ocean pollution, biodiversity and commercial and recreational fisheries. Figure 1. Coastal wetlands come in all shapes and sizes and occur all over the world. These important systems provide habitat for countless animal species and support the livelihoods of coastal and indigenous communities. Images: Upper left: The Ashepoo, Combahee, Edisto (ACE) Basin National Estuarine Research Reserve (source: ACE Basin); Upper right: Mangrove swamps of the United States South Atlantic (source: NOAA); Bottom left: Blackbird Creek Reserve in Townsend, DE (photo credit: Eric Crossan); Bottom right: Coastal wetlands of the Great Lakes (source: USFWS). Global-scale projections suggest that 20% to 90% of wetland area could be lost by the end of the century depending on the rate of sea-level rise. Large-scale projections so far haven’t considered processes such as the ability of marshes to build up vertically over time as accelerating sea-level rise triggers sedimentation through higher and more frequent flooding. This process and others like it are known as biophysical feedback mechanisms and are more commonly included in local-scale models. Existing global-scale projections have also not yet fully accounted for the area available for vegetation to colonize following sediment deposition. This available area is known as accommodation space and can be thought of as the potential for marsh habitat to build upwards or migrate inland in response to changing flooding patterns associated with rising sea levels. A recent study led by Mark Schuerch at Lincoln and Cambridge universities in the United Kingdom uses a new integrated modeling approach to address the limitations of previous global-scale projections. By considering both 1) vertical adaptability of coastal wetlands by biophysical feedbacks and 2) horizontal adaptability through interactions between wetland migration and man-made barriers (such as flood protection structures, roads, built infrastructure and other impervious surfaces), the authors project coastal wetland resilience to 21st century sea-level rise under multiple coastal management strategies. 110 cm based on based on RCP 8.5.
nature-based adaptation scenario 2 with a high, urban-like population density (150-300 per km2). In the business-as-usual or rural density scenario, coastal populations are considered more spread out and incorporate man-made coastal protection structures over larger extents. The nature-based adaptation scenarios assume that to varying degrees communities move away from the coast in response to sea-level rise, remove existing coastal protection structures and aggregate in inland population centers, which, in turn, increases accommodation space for wetlands along the coasts. Population density is a critical component in projected changes in wetland area under all three sea-level rise scenarios. Coastal wetlands experience global losses across all sea-level rise scenarios if lower population densities are considered. These losses occur because people are more spread out along the coast reducing the amount of space for wetlands to adapt. Conversely, if coastal populations aggregate in higher density, more urban communities away from the coast (as with the nature-based scenarios of >20 people per km2) more accommodation space is available for wetlands to migrate inland in response to sea-level rise. Under both nature-based scenarios, global wetland area could increase by 2100. With a combination of rural population densities (business-as-usual scenario) and the highest rate of sea-level rise (RCP 8.5 estimate of more than one meter), global wetlands are projected to lose between 30% and 8% of their total area by 2100 due primarily to an increasing deficiency in sediment supply (Figure 1 from Schuerch et al. 2018). If coastal wetlands have enough accommodation space based on nature-based scenario 2, these systems could increase in area by up to 60% by the end of the century even under the most extreme rates of sea-level rise. The ranges in relative wetland gains or losses are lower under RCP 2.6 sea-level rise but show a similar pattern to the RCP 4.5 and RCP 8.5 scenarios. Global wetland area is projected to range between a loss of 8% and 0% (no change) under the business-as-usual population density thresholds. Gains in total wetland area could approach 15% following the upper population density threshold of nature-based adaptation scenario 2 (Figure 1 from Schuerch et al.). These results suggest that there are critical wetland benefits of aggressively mitigating greenhouse gas emissions as characterized by the RCP 2.6 climate future even under business-as-usual population densities. The projections in wetland gains and losses underscore the importance of providing these habitats enough space to migrate inland in response to low, medium and high rates of sea-level rise. These changes are not expected to occur uniformly across coastal systems worldwide though. Under the business-as-usual scenario, the Caribbean, southern United States and Southeast Asia could experience the greatest total losses of wetland area. Relative losses of wetlands show slightly different patterns with the largest percent decreases occurring in the Caribbean, eastern United States, western Baltic Sea, Mediterranean Sea and Southeast Asia (Figure 2 from Schuerch et al.). In regions where there is an insufficient supply of sediment (sediment deficit) and where accommodation space is low, percent losses of total wetland area are projected to be highest. These areas include the Caribbean Sea islands, western Baltic Sea and the coasts of the eastern and western United States. Other areas with plenty of available sediment (sediment excess), such as large extents of Asia, South America and northwest Europe, correspond with areas of low relative losses of wetlands despite limited accommodation space because sediment deposition offsets sea-level rise. These results highlight the importance of accounting for sediment build up in projections and also providing wetlands sufficient space for inland migration in coastal management planning. Previous studies have acknowledged that low sediment supply can increase the risk of coastal wetland loss from sea-level rise, however, Schuerch et al. show that sediment supply has a relatively small impact on projected wetland area when sediment accretion is considered. Accommodation space has a stronger control on the persistence of wetlands against rising sea levels. In fact, even sediment deficient regions could experience an increase in wetland area if there is sufficient accommodation space. In summary, this study provides new insights into the resilience of coastal wetlands if they have enough space to migrate. The broad application of nature-based solutions in coastal areas, such as those examined here, may help preserve and even proliferate wetlands and the critical ecosystem services they provide despite inevitable, yet uncertain, sea-level rise throughout this century. 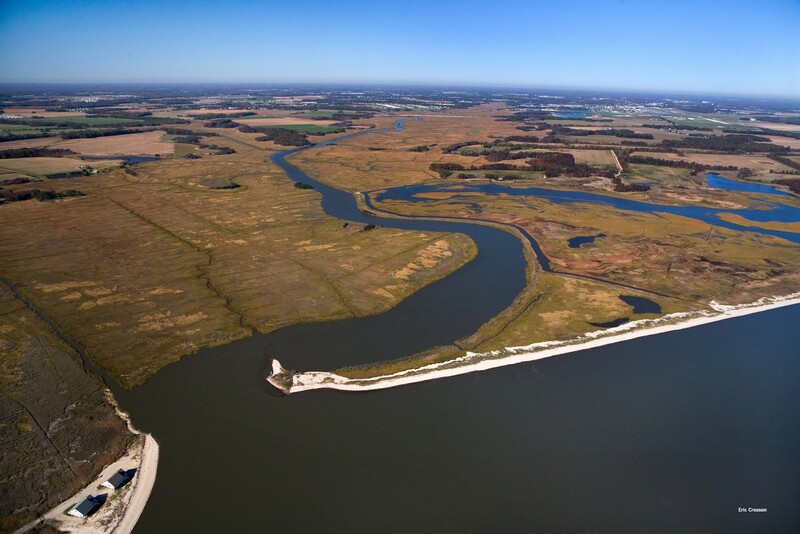 Cover Image: Aerial view of the Delaware National Estuarine Research Reserve St. Jones Reserve component near Dover. Photo Credit: Eric Crossan.